Did you know that the world’s second most beautiful beach is located in Samaná? It is true! It’s called Playa Rincón and it was a must see beach for me! We (me and my mate) decided to rent a car to get to that beach because it was the cheapest option and we thought we can also drive around the whole Samaná area. We were glad to receive help from Getawaydominicanrepublic.com to find a car for one day. I want to be honest and it might sound harsh: I would not have found a reliable enough place to rent a car on my own. All of the companies in Samaná town look a bit shady from the outside. The signs are covered with dust and the doors are not necessarily open to welcome you to take a peek inside. If you go to Samaná, I want to encourage you to step in even though it might seem a bit odd. The awesome tour company that we had for whale watching had their office basically in a grocery shop. Offline Google Maps on and here we go! May I present the second most beautiful beach in the world: Playa Rincón! I took the shotgun seat and a few times along the way I thought I will wet my pants when we had to use the wrong side of the road to avoid some of the worst bits of the road. We first headed from Samaná town to Playa del Rincón. It’s just the second most beautiful beach in the entire world! 😉 But the road there is amazingly horrible, especially the last few kilometers! Without lying it was the longest 1,5km I have ever had in my life. It was a sand road – or more like a ROAD OF ROCKS. Full of big, sharp, fist size rocks that try to kill your tires and I was so sure that we would never make it to the beach. But we did and it was breathtakingly beautiful! The water was amazingly turquoise, the sand was powder white and the mountain scenery was incredible. The beach was so worth the drive! Also the views when we drove there were out of this world! At Rincón we had one rain shower but luckily it lasted no longer than five minutes. Playa Rincón is in a valley so the weather might be very unstable. On the beach there are some sunbeds, a few restaurants and a gift shop. Many of the visitors come to this beach with boat tours. Some like us had dared to take the bumpy road. The water is just so amazing in color here at Playa Rincón! It took us two hours to drive back and forth to Rincón from Samaná. After Rincón we drove through Samaná town and headed to Playa Bonita which is located in the northwest of Samaná area. It was a mountain route passing with beautiful sugar hills. And also many horse farms that offer horseback riding to El Limón waterfall which we sadly didn’t have any time for on this trip. It was only 30ish kilometers but it took us 50 minutes to drive since the roads are so curvy. It was funny to check on the GPS since it looked like a snake. There were a lot of horses by the road on the sugar hills. 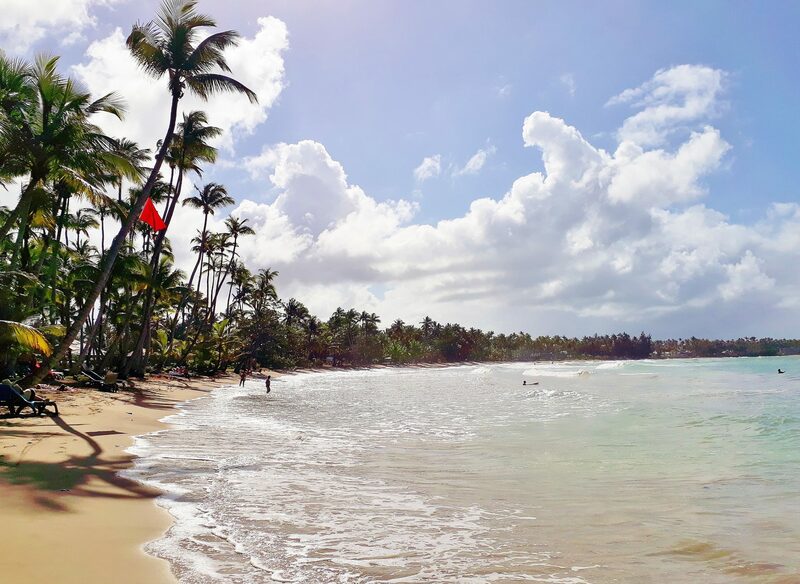 Playa Bonita is a very beautiful beach – almost as beautiful as El Rincón if you ask me! There were quite big waves hitting the beach so it was more suitable for surfing than swimming. We ate our snacks in the shadow of palm trees and enjoyed the relaxing atmosphere. Playa Bonita was lovely also because it wasn’t packed with tourists. There were some privately owned residences near the beach but the crowd was minor compared to Playa Rincón. Playa Bonita – the right name for a beautiful beach! From Playa Bonita we headed towards Las Terrenas and its nearby beaches. Las Terrenas – wow- how should I put it. The streets were amazingly narrow, packed with cars and one-way streets. I think I lost more hair there than during most of our driving and I left handprints on the shotgun seat for holding it so tightly. I prayed for a parking space and like a miracle we got one, not near the beach we wanted to reach though. We had to walk 1,5 kilometers to the beach we wanted to go to. I was glad we saw these other beaches along the way but in the end we walked until we saw the beach from a distance and thought the other two we’ve seen already were more beautiful. We headed back to Samaná on a different route and saw the beautiful coastline along the way before we climbed up again to the sugar hills. There the traffic was quite smooth and not too many cars. All in all, a crazy driving experience but I have no regrets! It was AMAZING! And we saw so much in one day. The price level in Dominican Republic was surprisingly expensive at least for me. The price for a taxi from Samaná to Playa Rincón and back was 100 USD (68km). We rented our car for 45 USD and we saw everything we wanted and more. The gasoline was approximately 15 USD for the day. Try it if you dare! Just remember that in the roundabouts the one already inside the roundabout is the one who has to let the other cars come in first. Read also about the whale watching tour I did in Samaná!